Army soldiers run computer networks. Airmen lead people to maintain complex aircraft. Marines lead communications efforts in the military and with civilian populations. Every job in the military has characteristics that translate to the civilian workplace. Clearly identifying them and being able to tell the story will be a big part of any successful military to civilian transition. Here are a few pointers to make that easier. Keep records. A military service person will always be able to get copies of service records. I am talking about these but more detailed records of the work that has been done. I recently spent time working with a client who served in the Army in Iraq, where he was responsible for running his company’s computer network and ensuring that it was secure and available. We spent time discussing the size of the network, the number of users, any special configurations used and other details. Without sharing anything classified, I was able to get a good picture of what he did and described it in his résumé. He has had success in his civilian search. Think about the next step. The sailor who has a goal for civilian employment can be thinking about the work that she is doing in the Navy and how it is similar to jobs outside of the service. The military is full of jargon and abbreviations that need to be translated into civilian-speak. Read civilian job postings and understand their descriptions, qualifications and requirements. Connect the dots in your résumé, describing how what you did on that destroyer is exactly what the ABC Company in Scranton is looking for. Start building a network. It is easy to get caught up in the insulated world of the military, only to come out at the other end without connections in the outside world. Start working on it right away. There are many people and civic organizations that want to help you and get to know service members. 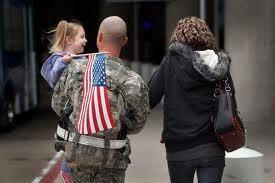 Many are veterans themselves and they will help when the enlistment is over. Thanks for your service, veterans! Feel free to ask questions or share other tips in the comments below. Bill Florin is the President of Resu-mazing Services Company and served in the U.S. Army Reserve.